In the first half of September, The Championships were held at Karuizawa 72 Golf East Course and hosted by Japan Golf Association (JGA) after the Matches took place 52 years ago in Japan. 1,000 players and delegates from 50 countries for women’s matches and 70 countries for men’s gathered as one of the biggest international championships. 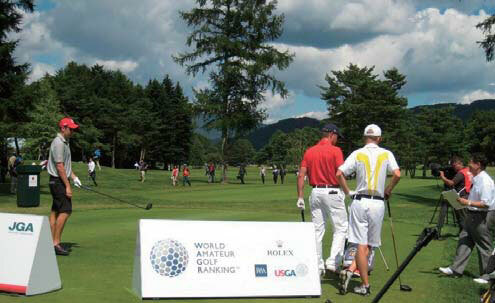 Well-known pros such as Tiger Woods, Phil Mickelson, Paula Creamer, and Shigeki Maruyama, played in this event as amateurs. At JGA’s request, IAK ran an information desk in the lobby of Karuizawa Prince Hotel West where 20 IAK members worked on shifts over 14 days. General inquiries came from English, Spanish, Portuguese, German and Chinese speakers. 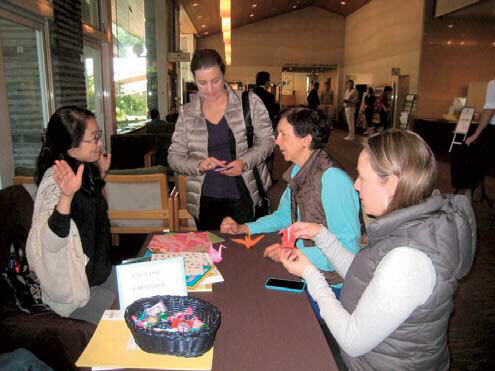 During the two-week period, IAK members taught origami and Japanese greetings. 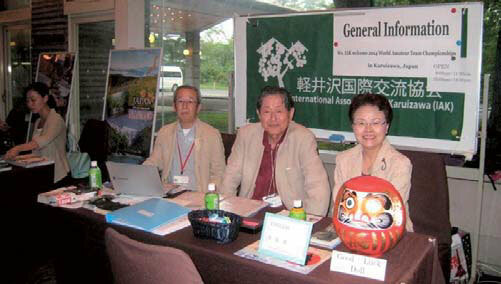 A good luck daruma doll on the desk became popular among the players and delegates. Touching it for good luck, many took photos alongside it. 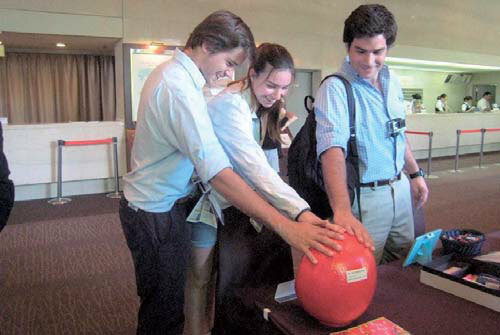 This being their first visit to Japan, most visitors came prepared with smart phones and tablets. Typical questions about the Karuizawa area related to Shiraito Falls, Karuizawa Bird Sanctuary, Onioshidashi and Kumoba Pond. They also showed interest in Shiga Koen’s famous snow monkeys, Matsumoto Castle. Nagano Zenkouji temple, Tokyo, Kyoto and Nikko areas. Because current printed tourist info doesn’t include timetables, fares, transfer locations to or from Karuizawa, our members were embarrassed each time they had to inquire by phone each time. Unfortunately, bus stops do not provide info in foreign languages showing route numbers or stops. Likewise it is not clear how to call a taxi. Though our IAK staff were prepared with a list of restaurants accepting credit cards and offering English menus, there were only a few inquiries. Most delegates staying at the Prince Hotel ate onsite and its neighboring shopping center. We had a Turkish delegate ask which iron griddle (teppanyaki) restaurant we recommended. IAK members shared the names of Korean barbecue and grilled beefsteak restaurants. But, he meant the kind where guests sit around a large hibachi and the chef grills meats, sea food, vegetables while juggling his knife. These are less common in rural areas of Japan, so our team had to call around to find such a restaurant. Unfortunately with a price of 12,000 -15,000 yen per person, it was too expensive for his tastes. Famous Kobe Beef was also in demand among several delegates. It was a rare treat to host 1,000 visitors in Karuizawa from 70 countries for two weeks. IAK would like to submit a proposal to make needed improvements on behalf of our growing international constituency in an effort to make their stay as enjoyable as possible. To promote Karuizawa facilities as practice venues for foreign teams in the 2020 Tokyo Olympics and Paralympics, a committee meeting to advise the town office was held on July 16th. IAK Vice-Chairman Mr. Takaishi (former Deputy Secretary General of Nagano Winter Olympic Games organizing committee) was selected as one of eight committee members. Though official requirements for athletic facilities is still unknown, the group will recommend ways to advertise our town’s attractiveness and promote friendship among the athletes. IAK members also volunteered at the Red Cross booth and helped with interpretation for students from ISAK who were running the stamp booths. This was a perfect-weather opportunity to introduce Karuizawa residents to our international organization and encourage new members to get involved. We appreciate everyone’s help and look forward to seeing you again! The third country featured in our national spotlight series was Germany, held on November 5th. With the theme “Germany: Land of Thinkers and Machines”, IAK Director Thomas Koch presented German history, culture, politics and pastries to 60 IAK members and guests who came to Chuo-Kominkan in spite of the rain. Speaking in Japanese, he captivated the audience as he recounted Germany’s rise to power and struggle with despair during wartime. Following the presentation, everyone enjoyed chatting and eating homemade bread and cake. Memorial Concert for 150 Year Anniversary Between Japan and SwitzerlandOn Oct 8, the concert was held by two musicians, a violinist and a pianist of ex. Members of Swiss Romande Symphony. A Japanese violinist, one of IAK member’s sister came here from Geneva for it. IAK helped promote the concert. On October 11-13 the Karuizawa International Choir Festival celebrated its 10 year anniversary at Ohga Hall. Overseas delegates from Estonia, Belarus and the Philippines, as well as Japanese choir groups participated. IAK supported the event. On October 18, the Karuizawa Universal Sports Festival was held at new Kazakoshi Athletic Center by the Social Welfare Groups. Citizens, young and old, alongside people with disabilities to enjoy the fun games. IAK hoped to form a team, but was unable. Nevertheless, we provided voluntary service for preparation. IAK members and guests are cordially invited to the year-end event for fun! Admission: Members: 2,500 yen/person (Free for ages 12 and under), Guests: 3,000 yen/person. Includes light meal, dessert and coffee. A cash bar will be available for beverage service. Reservations: IAK members will be mailed an official invitation with RSVP info. IAK has been requested by the Karuizawa International Curling organizing committee to provide interpreters for international players from Canada, Switzerland, Korea and Russia. Task: Support to international teams during the games and opening and closing ceremonies. IAK curling team members and international members are specially requested to offer services. Details will be included on the application. I grew up in the suburbs of Chicago, home to famous Route 66 and gateway to the untamed West. By the time I turned 12 years old, I had been to half of America’s 50 states with my parents on various road trips. When I turned 13, I embarked on yet another journey – my first homestay in America. Our middle school coordinated a student exchange program with Alpena, a city in northeastern Michigan. A dozen of us ventured into the unknown to experience life in another part of the country for one week; and what a week it was. I experienced many firsts on that adventure. It was my first visit to a huge paper mill, my first visit to an Amish farm where I got to milk an actual cow and my first visit to Canada aboard a ship along the Sault Ste. Marie. This was also the first time I stayed with another family apart from my own. I remember vividly being given the red-carpet treatment like an ambassador. Each student had a host family to stay with and their own bed. We were shuttled around like royalty between the various events with plenty of food and break time to enjoy the sights. That trip taught me that despite our many differences in lifestyle, we have lots of things in common. I made many friends and strengthened existing relationships with my classmates. It was a voyage that I still have many fond memories of today. 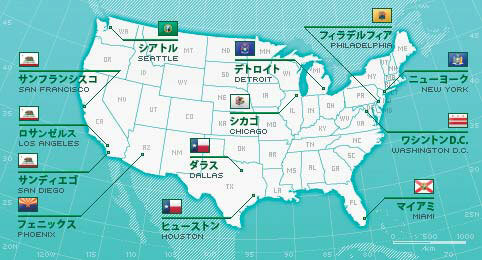 Karuizawa is my hometown, although I currently live in Matsumoto. Matsumoto is a mid-sized city located in the center of Nagano Prefecture, a gateway to Kamikochi and the breathtaking Japan Alps mountain resort. Matsumoto boasts historical treasuries such as Matsumoto Castle and rich art and fine music festivals year around. Intervened by high peaks of over 3,000 meter mountain, Nagano prefecture forms four basins, Matsumoto, Ina, Saku, and Zenkoji as shown in the lyrics of “Shinano-no-kuni” and each area keeps peculiar traditions and the way of life. Having lived in Matsumoto for ten years, I got a feel of the way of Matsumoto life. Both tourists and residents view the same city, but they gaze it differently. As a resident, I have been enchanted by the city’s traditions, humanity, and its aerial feeling, and have noticed that citizens here in Matsumoto often make a boast of the city. There are plenty activities and autonomy organized by the local citizens. Historical heritage such as Matsumoto Castle, Old Kaichi Elementary School, and Old Matsumoto High School were well preserved by the civic voluntary actions and fund-raising campaigns. I got to know the stories for the first time only after I lived in Matsumoto. People’s attachment to the symbol of the town is extraordinary. On the contrary, the holiday resort Karuizawa welcomes millions of visitors during the peak summer season. The diversity of the residents’ profiles consists of those holiday home residents, new settlers, and old residents. When it comes to the emotional attachment to the town, inhabitants with various backgrounds possess diverse feelings. Karuizawa, however, may be the hometown for every single resident including myself who loves Mt. Asama and magical landscapes. I proudly say that Karuizawa is my hometown, and I hope this beautiful highland resort lasts for another 100 years and more.